Little bits today. I'll get a site update here sometime this week. I read the Star Wars Insider #89 online supplement yesterday and to my surprise was an article by friend Joe Corroney about the illustrations he did for mutual friend Abel Pena's story, Underworld: A Galaxy of Scum and Villainy, the article for Joe's art was called The Art of the Underworld. Yep, Corroney's Guri was based on my image. 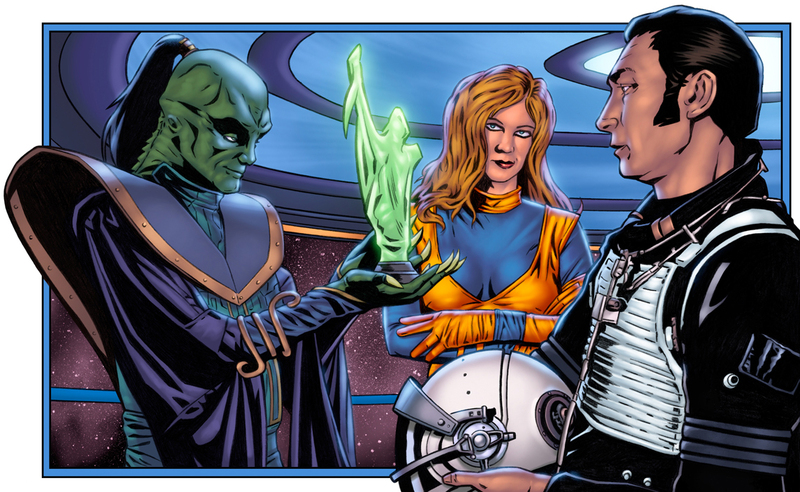 Totally cool to be rendered by one of my favorite artists and to be placed in the SW universe with Prince Xixor and BoShek no less! AH! Friend, Milton Soares Jr., linked me up to his fan film after reading the above article. Here's the link, Shadows of the Empire - Fan Film. It's pretty good and fun to see the book in action figure form! It takes a long while to download but I think you'll enjoy. After finishing the Lord of the Rings Masterpieces cards I decided to do a few more LOTR related drawings only larger in scale. The first is Arwen, she'll be finished later tonight and will be up on Ebay at some point. I'll let you all know when that happens. Harry Fielder also sent his regards to all this morning! I think that must be the ultimate accolade - to have your visage immortalised in the SW galaxy! Congrats! As a fan it really is neat. And, thank you nob01, I appreciate the comment. Your new Arwen art is gorgeous... wow. Hey Leah! Congratulations on Lord of the Rings and Guri!